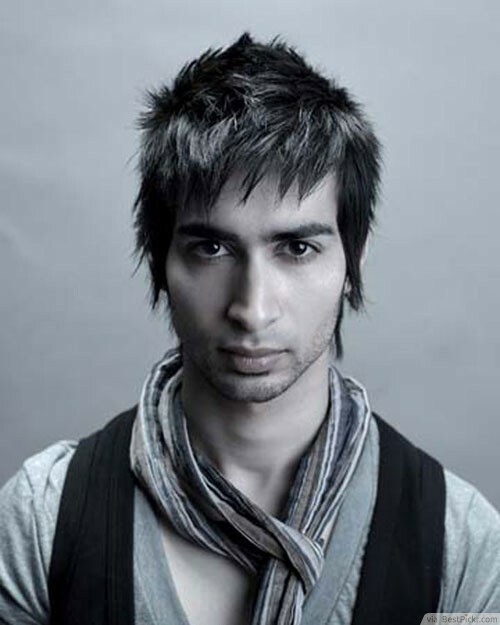 The fringe is a very popular haircut for guys because it’s so versatile. To really get that scene look, grow it out and style it by pushing it all in one direction. Let your bangs grow longer than the rest and angle them downwards. Because the haircut is so layered, it’s great for adding peekaboo’s of color underneath. The other great thing about this haircut is that after a while of styling it the same way, your hair will start to train itself! This is a great hairstyle for naturally straight, coarse hair because that texture will help it to stay in place better. The heavy chunk of blonde in the front is a fun statement piece and can give you the opportunity to really personalize your style. Use strong hair wax to spike the hair out for the trendiest of scene styling. 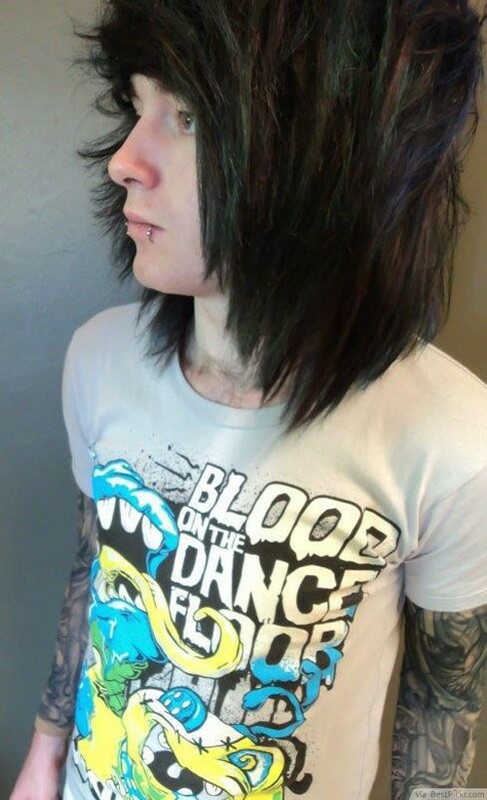 This is the most popular style of scene hair for guys. It all starts with the right haircut - short layers in the back that get increasingly longer as you move forward and long angled bangs. Have your hair stylist cut the layers with a razor for an edgy pointed look. Make sure you have a flat iron on hand, some texturizing pomade and hairspray on hand for styling. 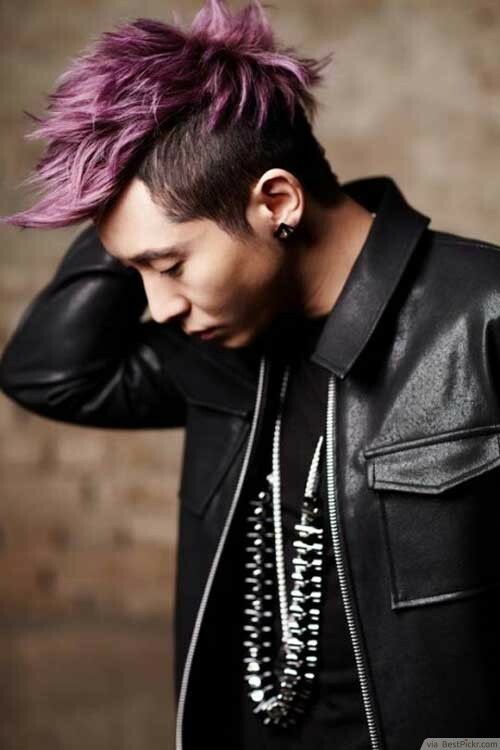 The Undercut style is a fabulously flattering cut on almost any guy. Traditionally it’s worn slicked back by Rock stars, but amp up the style factor and wear it forward! 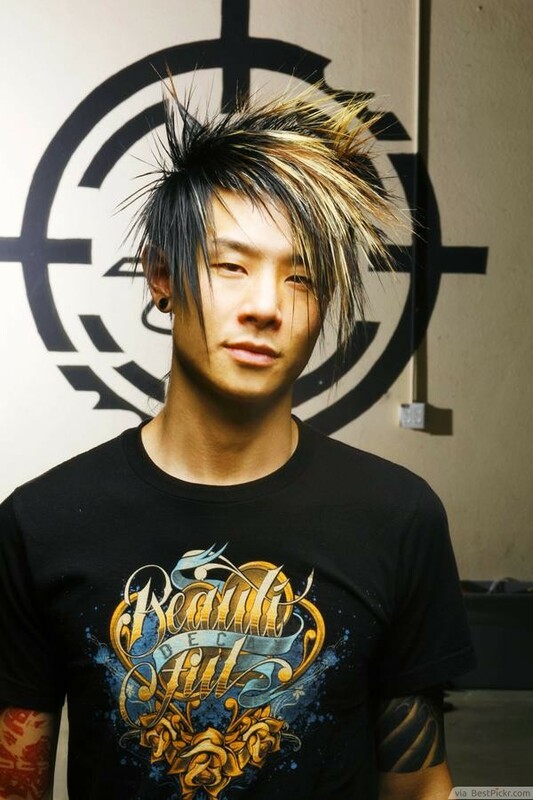 Scene guys can tousle the hair with product for an even edgier appearance. Dying it a wild color can make it a scene trendsetter and make you an eye catcher at the next show venue. 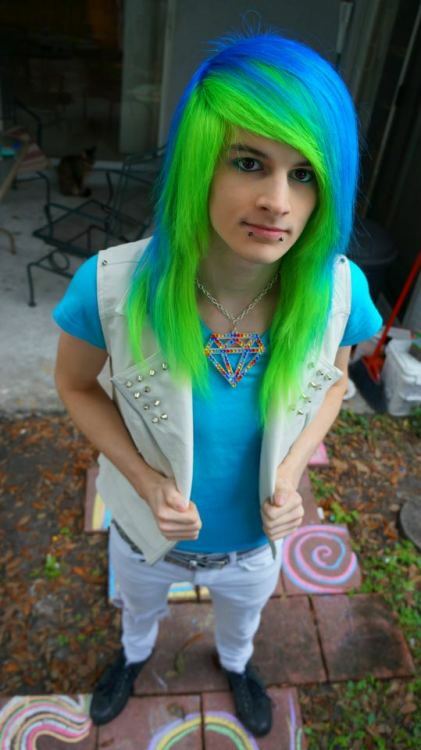 Be a showstopper with neon blue and green hair if your personality has the intensity to match it. 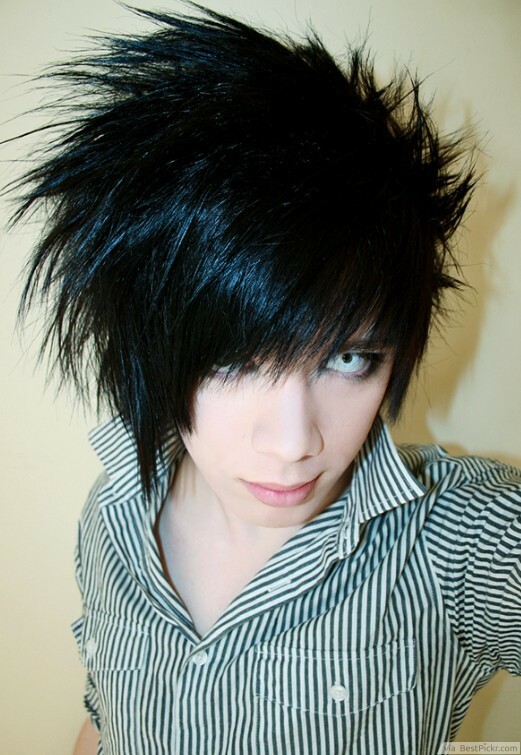 With young men's scene hair, the brighter the colors, the better, so this is the perfect hairstyle to bring that to life. Grow it long and keep a heavy bang with a deep side part for an even more scene look. 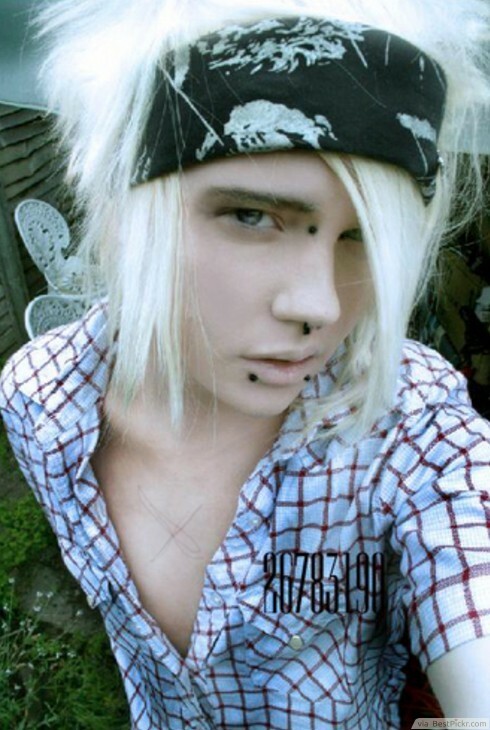 A bandana is the perfect scene style accessory for Punk or Emo guys. Choose one that complements your outfit but isn’t to matchy-matchy. Fold the bandana into a band and tie it on top of the hair and across your forehead. Leave your bangs tucked underneath and pull the teased and texturized layers out of the top. This teenage style can work with any color and texture hair so don’t be afraid to try it! 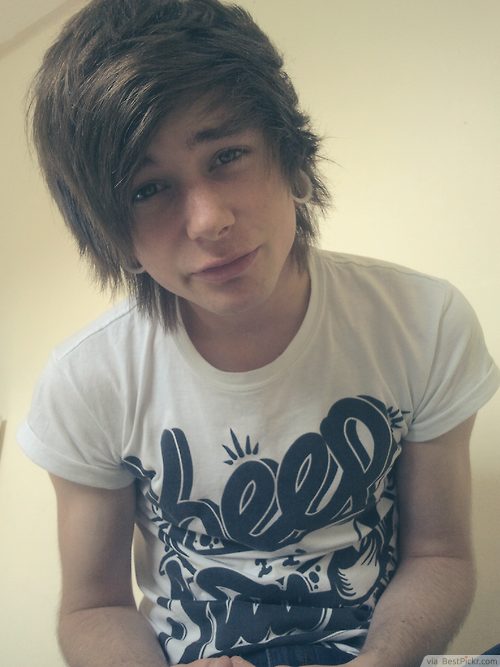 This haircut is perfect for guys who like to keep their hair longer, but still like that scene style. Make sure that the layers are angled and fram your face and neck as they go down. Push your bangs all to one side, tousle the back and you’re good to go! For some extra visual interest and scene cred, throw in some bright colored chunks or highlights. 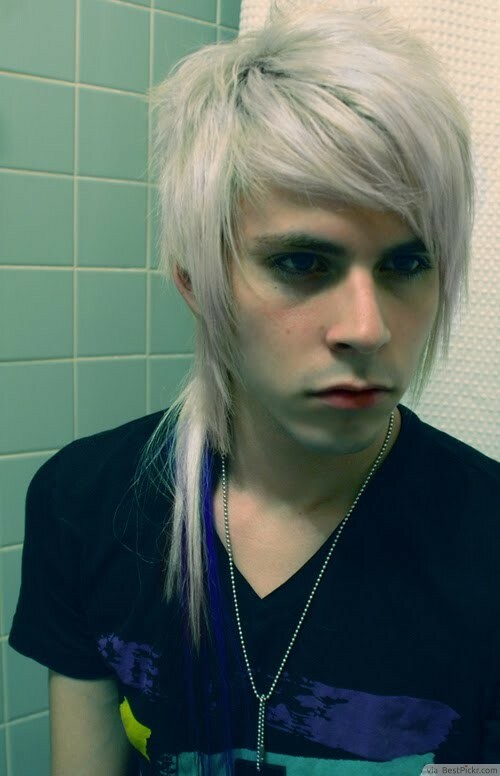 This icy platinum blonde hair color looks amazing on young men. The hair is tapered around the head with short layers on the sides and back for endless texturizing possibilities. The soft layered bangs, angled to the side flatter a very square or pointed masculine face. Use a violet shampoo and conditioner to maintain the platinum color and avoid a brassy tinge. The Faux Hawk is not only a great hairstyle for more mature men, but also a very versatile one. Use a hair wax to push the hair up and to the center for an edgy look, piece out your bangs and keep them forward for a scene style, or tousle it for a carefree no fuss look. If you’re feeling bold, experiment with highlights or color blocking for an even more intense scene look. This is a daring hairstyle only for a fearless scene dude. The asymmetrical color blocking with black, blonde and red is as amazing looking as it is simple to do for most boys. Bleach the section that will stay blonde and the section that will be a different color. Then in a separate process, protect the rest of the hair with vaseline and foils and dye the designated section your choice of color.